Because of my most current day job, I have been unable to really focus on my genealogical endeavors. And for some time now I have been too comfortable doing genealogy because, 1) most genealogies I have done in the past decade have been almost all from Argao and, 2) I am so used to the simplicity of tracing Argawanon trees due mostly to the abundance of Spanish-era records still available for Argao. So days ago I took on the challenge of: 1) doing a non-Argawanon, non-Cebuano genealogy, 2) using 90% of non-Spanish era records, and 3) doing two genealogies not related to me in any way. Although this started as a way to challenge myself and check if I still got it when it comes to tracing family trees, this small project was executed also in the hope of encouraging others who have no time to go on digging in church archives or who cannot as yet visit the Family History Center of the Church of Jesus Christof Latter-Day Saints to make use of their FREE and huge collection of records to try to take advantage of something that many of us who started with genealogy years ago did not yet have: the internet. Today, some people even stumble upon completely traced family trees available online. While it is true that not all can be that lucky, the presence of the World Wide Web has indeed made research into genealogy a whole lot easier and faster. So, going back to my project. I decided to do one friend's genealogy and one famous person's, so I ended up doing my superfriend Domz's family tree as well as super boxer Manny Pacquiao’s. And what better day to post this online than on the day that started the Filipino people’s use of surnames; 163 years ago Governor-General Narciso Z. Claveria decreed that indio or native residents of the Philippines should adopt a family name from a list of names and words compiled by the friars, now known as the Catalogo Alfabetico de Apellidos. With my friend's family tree it was really very straightforward. I asked him for the names of his parents and grandparents, as well as their vital records: birth, marriage, and when applicable, death dates. This is a basic tenet in genealogy; always work your way up the family tree by starting with what you know, and then work back to the murky past. Domz's roots are all Waray, with his maternal line coming from Villareal, Samar and his paternal line from Pinabacdao, Samar. So, I thought it would be quite easy indeed to trace his family. First step: I did a general search in Google for any of the families related to my friend, but nothing was available that was useful to my project. 2nd step: I then went to the online resource of the Church of Jesus Christ of Latter-Day Saints (http://www.familysearch.org/) to get an idea of how much data there is for Domz's family. Using their Catalog search engine, I searched for “Philippines, Samar, Villareal” which turned out to be a goldmine. Its Church of Saint Rose of Lima has records going back to 1762. Of course, I wasn’t interested in the church records yet as that would entail my going to the LDS Family History Center to do the research. So I looked at the available civil registration documents and was rewarded with records from 1921-1930. Good, so far. 3rd step: I then went to the Asia & The Middle East Historical Records Collection of the same website, and limited the search to records from the Philippines. I chose the records entitled “Philippines, Civil Registration (Archives Division), 1902-1945” as this was where the 1921-1930 civil registration records of Villareal would be found. 4th step: I repeated the same steps for my friend Domz’s dad’s hometown, but then I hit a dead-end. The records for Pinabacdao only go as far as 1947, which would mean I couldn’t extend Domz’s father’s side of the tree. But then it hit me. Many towns in the Philippines were created out of older towns and this was usually, but not always, the case. A quick search in the internet proved my hunch right. The municipality of Pinabacdao separated from the Municipality of Calbiga in 1946. So that meant all records for Pinabacdao from 1946 back may be found in Calbiga. And when I checked – bingo! Church records go back as far as 1844 and the civil records, accessible online, are from 1922-1931. Maternal grandparents – Expanded until the parents of this couple primarily because their marriage date was known to Domz’s family and the record was available in the online resource. Paternal grandparents – On the female line, extended one more generation when I found the birth record of Domz’s grandma’s brother. For the male line, I was able to add 2 more generations because I had a contact in Manila get the exact baptismal record of Domz’s grandpa, which gave both parents’ and grandparents’ names. If I had wanted to, I could have asked my research associate in Manila to check the LDS records further but that would be violating the rule I had set about using 90% of records that are not from the church. Still, in two days that I did the project I was able to trace my friend’s ancestry as far as 2 generations, back to his great-great-grandparents. And with the small amount of data I gathered I was still able to create a demographic narrative for his various branches of the family as well as find other relatives. 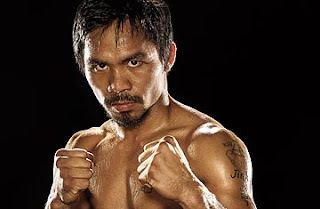 So, I was already slightly satisfied with the results so I decided to turn my attention to Manny Pacquiao’s roots. Manny Pacquiao is of course known all throughout the world. He is a favorite of many boxing enthusiasts and his generosity is legendary. His fame has also extended to include his wife, who now has her own clothing line, as well as to his mother, Dionisia Dapigran Pacquiao, who has tried her luck in the show business world and is more popularly known as Mommy D.
Of course tracing Pacquiao’s roots was a little bit more complicated. 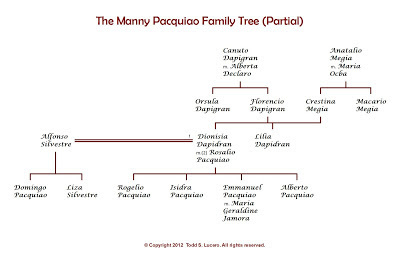 I am sure someone has already probably done Manny Pacquiao’s family tree, but I haven’t seen anything online that go farther back than his grandparents, so I decided to continue anyway. 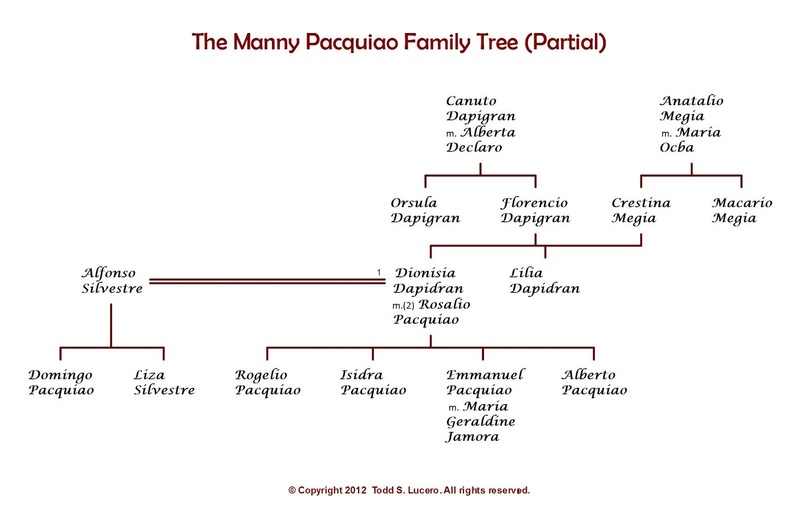 I decided to do Pacquiao’s mother’s family history because his father’s side of the family has not been as discussed than his mother’s. Even after trying all types of permutations for his father’s name I still ended up with nothing to extend Manny’s paternal family tree. So I was stuck with Mommy D.
The first resource I used in tracing Mommy D’s line was a blog about the people of Inopacan, Leyte. Before I stumbled across that site I always assumed Dionisia Pacquiao was from General Santos. As it turned out, she was born in the municipality of Inopacan, Leyte. The site gave her parents’ names as Florencio Declaro Dapigran and Crestina Ocba Megia, who were married in the same town on May 8, 1943. The site further stated that Florencio was 32 and Crestina 28 when they had Dionisia on May 13, 1949. Because the site also mentioned that Dionisia’s father Florencio Dapigran was from Baybay, Leyte, I spent the entire day looking at records from Baybay. Only when I decided to pause with the dad and switch first to looking for Mommy D’s mom did I stumble upon a surprise: Florencio Dapigran was also from Inopacan and not from Baybay! The website was wrong! And when I was lucky enough to find both Florencio Dapigran’s and Crestina Mejia’s birth entries, I discovered that the site was also incorrect in some other aspects. The site used the spelling “Dapidran” as Dionisia’s maiden name. I have not been able to see her birth certificate, but I was able to see her father’s as well as countless relatives in Baybay and Inopacan, Leyte and they were all originally surnamed “Dapigran”. 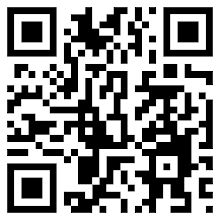 The site also used the version “Mejia” for Dionisia’s mother. In fact, her birth record and countless other cousins in Inopacan all carried “Megia”. Speaking of the mom, Mommy D’s mother’s name was spelled consistently in records as “Crestina” and not “Cristina”. The site inferred that Dionisia’s parents were born in the years 1911 and 1915, but their birth records indicate they were born much later, 1924 for Florencio and 1922 for Crestina. In fact, mom was slightly older than dad. Florencio Dapigran, Manny’s grandpa, was the son of Canuto Dapigran and Alberta Declaro, both born in 1897. As far as the records show, Canuto and Alberta had at least 5 children. The Dapigrans were all found in barnangay Conalum, Inopacan, Leyte. Florencio’s wife, Crestina Megia, was the daughter of Anatalio Megia and Maria Ocba, born in 1881 and 1887, respectively. Majority of the Megias in the records I checked came from barangay Esperanza, Inopacan, Leyte, though some also hailed from Conalum and Marao, both still in Inopacan. As much as I had wanted to use even a tiny bit of church records for this small project, I have been unable to. The municipal building and the church, both with all their Spanish-period records, were bombed by Japanese war planes in World War II, thus eliminating all old records forever. But both the trees I’ve traced for my friend Domz and Manny Pacquiao has given me a new sense of hope. Having only 5 days and using only the internet to do both, I was still rewarded with enough data to have a more or less complete picture of Domz’s and Pacquiao’s roots. Genealogy is even more fun and fulfilling than ever! It's always fun to do other genealogies. After 1992/1993 when I did a lot of the collateral and other non-blood relatives of my argaowanon grandmother, I started tracing my other cousins' branches, to which it extended to a lot of the families from the island I'm from. 21 years later and 12,044 names later, not counting the 5,702 names I gathered on my paternal grandmother's side nor 1,532 names on my paternal grandfather's side, I still help others with their genealogies, mainly because they don't know how to read/speak Hawaiian, Spanish or Portuguese. Those are the areas I tend to do better in searching. I may not do extensive and thorough research for others like what you have done for Argao (I only did that for a couple of my own branches), but I do manage to provide a few generations for people with sufficient proof for them to keep.